The above status map is not current. Questions about the status of any of the ranges shown above should be directed to . are held annually in different locations. Contact for more information. RCS Facility Certification Documentation Set (Range Book) example available on CD-ROM. AFRL is making available copies of its Range Book for the Advanced Compact Range. Send email request to , providing your name, mailing address, company/organization, range name, and reason for request. RCS Facility Certification Reviewer (Evaluator) information now available online. Welcome! This is a collaborative work in progress. 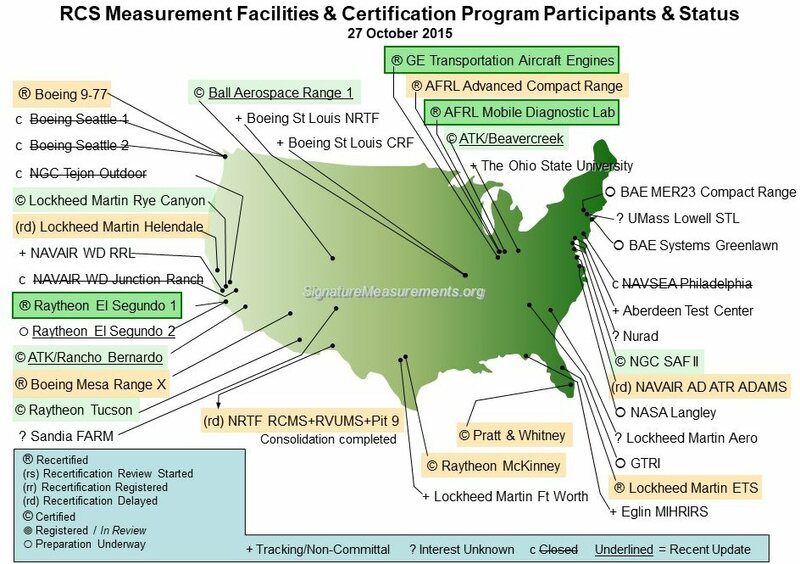 The collaborators include DoD entities and industry partners engaged in RCS measurements. The goal of this site is to promote cooperation by and between the collaborators and the US RCS community. The overarching goal is to improve the quality of data products produced by the US RCS community. This Web site is an outgrowth of the Radar Cross Section Measurements Working Group (RCSMWG) which was absorbed by the Range Commanders Council Signature Measurements Standards Group. Under the auspices of the RCC SMSG Radar Committee, a demonstration of the feasibility of certifying RCS facilities performed. Having successfully completed the demonstration, the RCC is no longer involved in the certification program. An historical review of the RCS Certification Demonstration Program is available for online viewing. Various points of contact at NIST and the participating facilities are listed at the end of that document. These projects were undertaken with significant participation by the National Institute of Standards and Technology (NIST, Department of Commerce). NIST helped to enforce the unbiased, rigorous scientific process necessary to raise the level of standards employed throughout government and industry. Within the context of certification of RCS facilities, NIST contributed by researching and tailoring a standard by which RCS facilities may be certified. The standard, still under review, is based on the National Conference of Standards Laboratories and American National Standards Institute document NCSL/ANSI-Z-540-1. A copy of the current version of the RCS-specific draft of a derivative document--Handbook for the Assurance of Radar Cross Section Measurements--is available for viewing (Part 1 = 82kB, Part 2 = 29kB) or downloading (in Microsoft Word, 125kB).